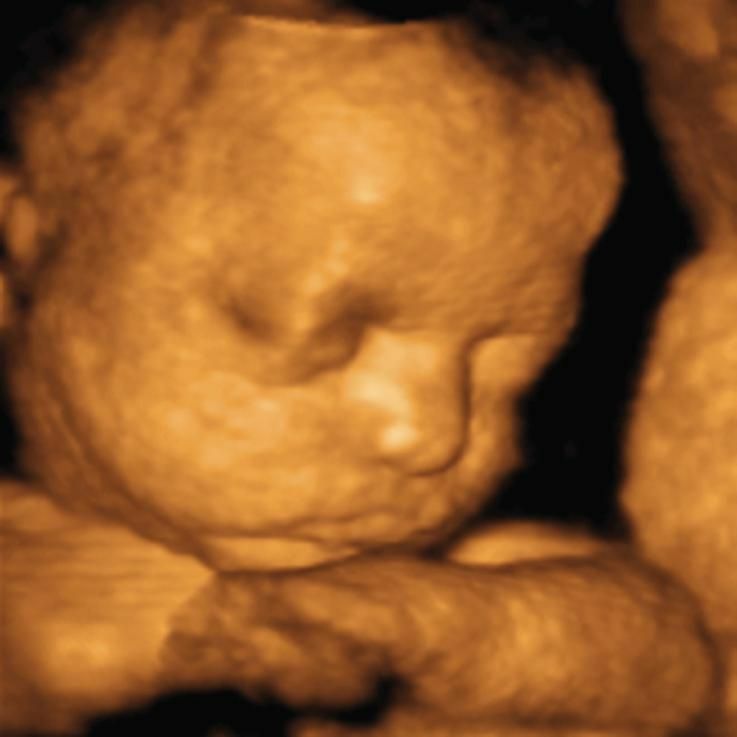 This image shows that the bridge of your baby’s nose is now more fully formed. The face is taking on a more rounded shape and some babies may look quite chubby from now on. Shadows around the top and sides of the head will increasingly give the illusion of hair. By this stage of pregnancy, your baby’s fingernails have grown and reach the tips of his fingers. By now, your baby’s fingernails have reached the tips of the fingers. The fingernails first appeared at 23 weeks, and as the development of the arms is consistently ahead of the legs, the toenails started to develop four weeks later. The future nail begins at the tip of each finger or toe, where a nail fold is formed. At the base of this nail fold, the cells start to harden into nail, in a process known as keratinization. The nails grow from new cells formed in the soft nail bed. It takes nine weeks for the nails to reach the fingertips and it will be a further four weeks before the toenails reach the tips of the toes. The nail is actually all the same colour, but the white part of the nail appears white because it does not have the nail bed, with its rich blood supply, beneath it to give the illusion of colour. Since the nails already reach the fingertips, it probably won’t be long after the birth before your baby’s nails need trimming – they are very fine and soft and you may find it easier to trim them by nibbling them away rather than trying to cut them. Or cut them with baby nail scissors while your baby is asleep and not wriggling around. Yoga is excellent exercise for the mind and body while you’re pregnant, and may be a cornerstone of your birth preparations if you choose to take active birth classes. An instructor will tailor a routine for your body and the stage of your pregnancy. The individual stretches shown here are ideal for opening up the pelvis and strengthening the legs. By practising them while you’re pregnant, you’ll be able to use them more effectively and confidently during labour. When you’re practising squatting, it may help if your partner supports you from behind. Get into a squatting position.Squat only if you find it easy to hold this position with your heels on the floor and your back straight. Sit with your left leg stretched out in front of you and right leg bent. Gently twist your body, placing your hands on the floor for additional support. Sit with one leg stretched out behind you, and the other tucked beneath your bump. Stretch upwards, breathing deeply throughout.